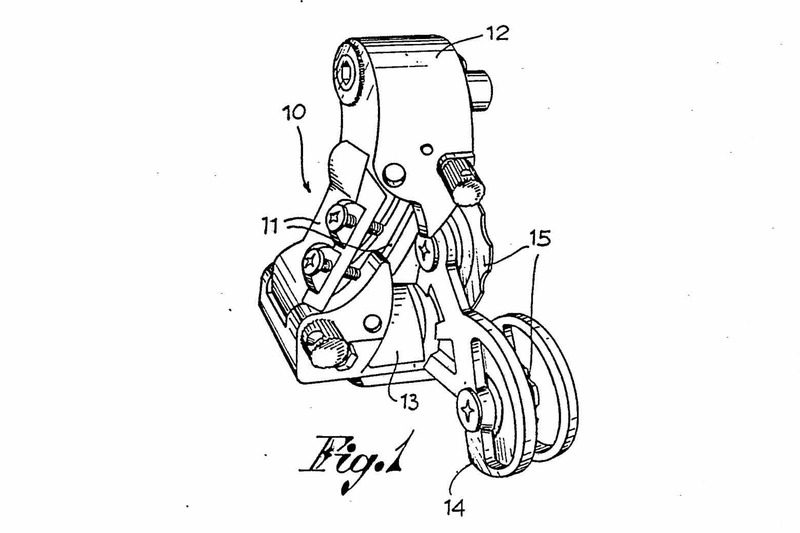 This patent describes a development of the Ofmega Mistral design, hiding the bolt that attaches the pulley cage to the front knuckle. This was very much the fashion of the time, starting from the 1987 Shimano Santé. Personally I found it more than a little inconvenient - but it remains accepted practice today. I may be wrong, but I think that Ofmega did not use the ‘Mistral’ name for the derailleur that used this ‘hidden bolt’ design. Instead I believe that they produced it to a lower quality standard and used it in their cheaper ‘Mundial’ groupset. And why is the main drawing backwards - showing a derailleur that could only be fitted on the non-chain-side of the bicycle? About as useful as a chocolate fire-guard.